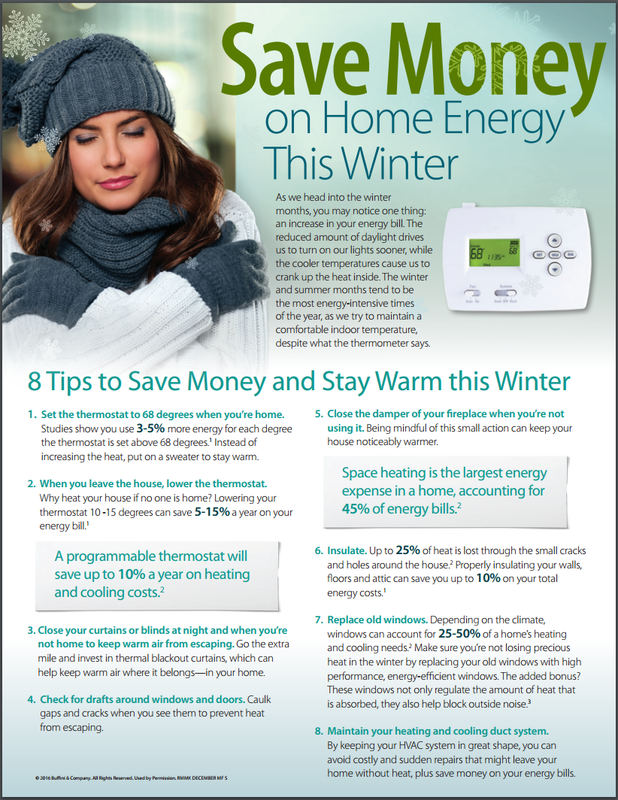 As we head into the winter months, you may notice one thing: an increase in your energy bill. The reduced amount of daylight drives us to turn on our lights sooner, while the cooler temperatures cause us to crank up the heat inside. The winter and summer months tend to be the most energy-intensive times of the year, as we try to maintain a comfortable indoor temperature, despite what the thermometer says. 1. Set the thermostat to 68 degrees when you’re home. Studies show you use 3-5% more energy for each degree the thermostat is set above 68 degrees.1 Instead of increasing the heat, put on a sweater to stay warm. 2. When you leave the house, lower the thermostat. Why heat your house if no one is home? Lowering your thermostat 10 -15 degrees can save 5-15% a year on your energy bill. A programmable thermostat will save up to 10% a year on heating and cooling costs. 3. Close your curtains or blinds at night and when you’re not home to keep warm air from escaping. Go the extra mile and invest in thermal blackout curtains, which can help keep warm air where it belongs—in your home. 4. Check for drafts around windows and doors. Caulk gaps and cracks when you see them to prevent heat from escaping. 5. Close the damper of your fireplace when you’re not using it. Being mindful of this small action can keep your house noticeably warmer. Space heating is the largest energy expense in a home, accounting for 45% of energy bills. Up to 25% of heat is lost through the small cracks and holes around the house. Properly insulating your walls, floors and attic can save you up to 10% on your total energy costs. Depending on the climate, windows can account for 25-50% of a home’s heating and cooling needs. Make sure you’re not losing precious heat in the winter by replacing your old windows with high performance, energy-efficient windows. The added bonus? These windows not only regulate the amount of heat that is absorbed, they also help block outside noise. 8. Maintain your heating and cooling duct system. By keeping your HVAC system in great shape, you can avoid costly and sudden repairs that might leave your home without heat, plus save money on your energy bills.